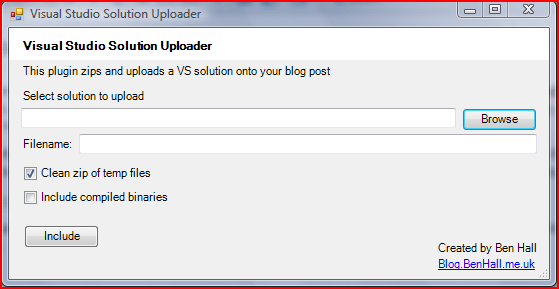 Over the past few days I have been creating a Visual Studio Solution Uploader as a Live Writer plugin. The plugin allows you to select a Visual Studio 2005 solution file, when selected the solution and the directory will be zipped and included in the blog post. All done in a few simple steps. If you wish, there is also the option to build the solution and have them also uploaded as a separate zip file. This is an early release as I want to get some feedback about what you think, there is more than likely to be one or two bugs. I have found it really useful, no longer do I have to manually zip and upload samples along with the blog, I can just get my plugin to do it all for me! The plugin uses the same settings as Windows Live Writer for publishing images, so if your blog provider doesn’t support uploads you will need to have your FTP configured. Big thanks to Scott who helped me get my settings correct. Any questions or comments, please let me know. (Update: I blogged this on the 3rd but I uploaded it to the wrong blog!…. Sorry). Really cool tool! Only problem is, I get an “Unsupported Media Type” error when trying to publish to my Blogger blog. Any ideas how to remedy this?